I managed to find the archaeological drawings of the two Danish finds of bronze age "scimitars". They show that both were sharp in the straight section of the blade, but were more or less blunt in the curled up end. I attach scans of the outer parts of the blades. I hope the scans are clear enough to make out the details in the cross sections. The drawings show that the edges were shaped quite like that of an axe. Clearly sturdy enough to do damage on bone. Both originals are a bit damaged, so it is no mystery one might think they are blunt, if you only see them as displyed in the rather dimly lit vitrines of the National Museum in Kopenhagen. As the curled up ends does not really show an edge, the impression that the whole blade might be blunt is easy to get. The one I got to handle in Stockholm had the same cross section as the Danish ones: it is very similar in all respects. This would show that all three "weapons" would probably have been put to the same se, whatever that might have been. Perhaps this can put a perspective on some seemingly blunt Kopesh as well: if the bronze is damaged by corrosion an axe style edge could well look like it has never been sharp. I do not mean to imply that all were originally sharp: the Iranian one in the British Museum was clearly blunt to begin with. I would expect other were just like that one. I just got some information on Canaanite khopesh examples from Brock. It comes from Swords and Daggers in Late Bronze Age Canaan by Sariel Shalev, part of the PBF series. There are a total of 11 khopeshes, divided into 5 types designated Types 8A-E. I'll post a drawing of one from each type and information on all of each type. The shortest is 36.4cm long, the next shortest is 55cm and the longest is 64.2cm. The author has an odd bit of terminology. He divides each into 3 parts: hilt, handle and blade. The hilt is what we'd expect by that term, but handle refers to the non-hilt, straight and unsharpened portion of the sword. The blade is the curved, sharpened portion. The maximum width and thickness he cites are for the hilt and I think they are for the fore-end of the hilt. The term he actually uses is hilt-base. First up, Type 8A. Average length is 57.1cm, width is 4.2cm and thickness is around 1.7cm. On average the hilt is 20.8% of the total length and the blade is 52.7%. Now for the individual swords. #165 from Gedor (cemetery), Judean Hills. L. 56.3cm, W. 4cm, Th. 1.8cm. The hilt is 24.2% of the total length, the handle is 24.2% and the blade is 52%; width is 7.1% of the length. L.B. II, first half of 14thC. Location unknown. #166 from Gedor (cemetery), Judean Hills. L. 57.8cm, W. 4.4cm, Th. 1.6cm. The hilt is 21.3% of the total length, the handle is 24.7% and the blade is 54.5%; width is 7.6% of the length. L.B. II, first half of 14thC. Location unknown. #167 from Gezer (tell), Shephelah Plain. L. 57.2cm, W. 4.2cm, Th. 1.6cm. The hilt is 22.9% of the total length, the handle is 25.3% and the blade is 51.7%; width is 7.3% of the length. Found with remains of ivory hilt plates. L.B. II, first half of 14thC. Location Museum Istanbul. #168 Origin unknown, purchased in Beirut. L. 62.9cm, W. 4cm, Th. 1.5cm. The hilt is 12.3% of the total length, the handle is 25.3% and the blade is 51.3%; width 6.4% of the length. Thought to be L.B. II. Location Museum Munchen. Now the drawing of #166. Type 8B. Average length 62.2cm, width 4.9cm and thickness 2.1cm. The hilt is 20.3% of the length and the blade is 57.5%. #169 Origin unknown. L. 64.2cm, W. 4.9cm, Th. 2.3cm. The hilt is 20.7% of the length, the handle is 26.9% and the blade is 57.6%; width is 7.6% of the length. L.B. II according to typological resemblance to swords from Tutankhamun Tomb. Location Jerusalem, Israel Museum. #170 Kurdani (?) (Tell Aphek), Akko Plain. L. 60.2cm, W. 4.9cm, Th. 1.8cm. The hilt is 19.9% of the length, the handle is 27.7% and the blade is 57.7%; width is 8.1% of the length. L.B. II according to resemblance to swords from Tutankhamun Tomb. Location Jerusalem, Israel Museum. #171 Ugarit, pit at foot of Acropolis, Syrian Coast. L. 58cm, W. 4.6cm. The hilt is 21% of the length, the handle is 26.2% and the blade is 54.1%; width is 7.9% of the length. L.B. II according to resemblance to Tut Tomb sword. Location Museum Paris. Type 8C, one example. #172 Shiqmona Coast, from the sea. L. 55.8cm, W. 4.6cm, Th. 2cm (being the wooden inlay of the hilt). The hilt is 21.6% of the length, the handle is 27% and the blade is 51.4%; width is 8.2% of the length. Engraved decoration of 6-8 dotted triangles framed within the blade base and an engraved line. L.B. II, 14thC., according to typological parallels. Location unknown. Type 8D, one example. #173 Beth-Yanai Coast, from the sea. L. 57.3cm, W. 3.4cm, Th. 1.7cm (with the wooden inlay of the hilt, but remaining on one side only). The hilt is 24.1% of the length, the handle is 20.8% and the blade is 55.1%; width is 5.9% of the length. L.B. II, 14thC. according to typological parallels. Location unknown. You will notice this is the simplest one of all, with a simple cross-section and no grooves. I think that makes it a candidate for what the common soldier carried. #174 Amman, temple near the airport. L. 55cm, W. 5.9cm. The hilt is 22.7% of the length, the handle is 26.4% and the blade is 52.2%; width is 10.7% of the length. L.B. II, end of 14thC. according to imported pottery at site and typological resemblance to the sword of Assyrian king Adadnirari I. Location unknown. #175 Kamid el-Loz, Lebanon's Baq'a. L. 36.4cm, W. 3.9cm. The hilt is 29% of the length, the handle is 23.5% and the blade is 47%; the width is 10.5% of the length. L.B. II. Location Museum Beirut. The imported pottery mentioned for #174 is mostly Mycenaean with some Cypriot, Cretean and Egyptian. Jeroen this is the same Khopesh, I found this on a French site, see attached. Do you have further information on the khopesh above? Why do you call it a Knife? Thanks! I've edited the text. Until you posted this, I only had the picture. It looks more like a curved knife then a khopesh. It doesn't have the straight unsharpened part between the grip and the curved blade. No dimentions. Judging from the length of the grip, I'd guess it's 30cm, give or take a few cm. For those interested, I just got word from Neil Burridge (from Bronze Age Craft: http://www.bronze-age-craft.com/) that he's considering casting the Type 8D khopesh from the drawings. It has a nice simple shape and cross-section and should be practical on the battlefield. It will also be easier to cast than the ones with more complex cross-sections, which will hold costs down, perhaps considerably since the more complex ones could have a fairly high failure rate. He wants to know how if there is enough interest in a reproduction to start making them. My khopesh is finished! The blade was cast by Neil Burrige (who sells them at http://www.bronze-age-craft.com/swords_for_sale.htm) when I visited him earlier this year. N.b. this khopesh is obviously not for sale, but for my own personal collection! I hope the scales stay on the grip. Have you debated the idea of drilling through the grip and peening some rivets to ensure that they stay put? At least one surviving original had cord and wire/ribbon overwrap. I hope the scales stay on the grip. I've done some testing prior to using the mixture. The honey/gum mixture seems to give a pretty good bond. Have you debated the idea of drilling through the grip and peening some rivets to ensure that they stay put? The original flange hilted khopeshes don't seem to have any rivet holes, so I'm not using rivets either. At least one surviving original had cord and wire/ribbon overwrap. Which one is that? I haven't seen any with any cord wrapping yet. You actually posted an image of it at the bottom of your 4th post in this thread. I think the bottom image which has #537 in it is the Kairo National Museum 3rd millenia B.C.sword that has an ornamental silver ribbon around the grip. I don't have much detail information about it unfortunately. That's the small khopesh from Tutankhamun. It's got gold foil bands around the wood, before the wood was attached to the khopesh. I've got a more detailed photo of this, which I'll include in the post on Tutankhamun's khopeshes. 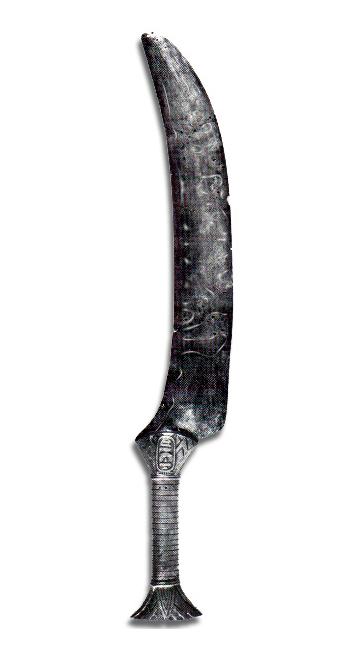 I thought that the kopesh was the iron age short sword, wich was the "prototype" of the gurka kukri. Was the name of these bronze age curved swords not "harpe"? That's the kopis (= greek for "to cut"), not the khopesh (egyptian for "knee", refering to the shape), two totally different things. And whether the kopis evolved into the khukuri is highly questionable. The harpe I don't know much about, other then that it's a mythological sword from ancient Greek, which supposedly sickle shaped. I found a picture here: http://www.theoi.com/Gallery/P23.19B.html. It doesn't look anything like a kopis or khopesh.